At today’s launch at the Sydney Opera House, the Sydney Festival announced a program that includes Gondwana’s very own #Marliya performing Spinifex Gum. Gondwana’s Artistic Director, Lyn Williams was at the Sydney Opera House launch and said, “I am thrilled to finally be able to say that Marliya will be performing the Spinifex Gum show at the Sydney Festival 25th January 2019 in the Opera House Concert Hall. 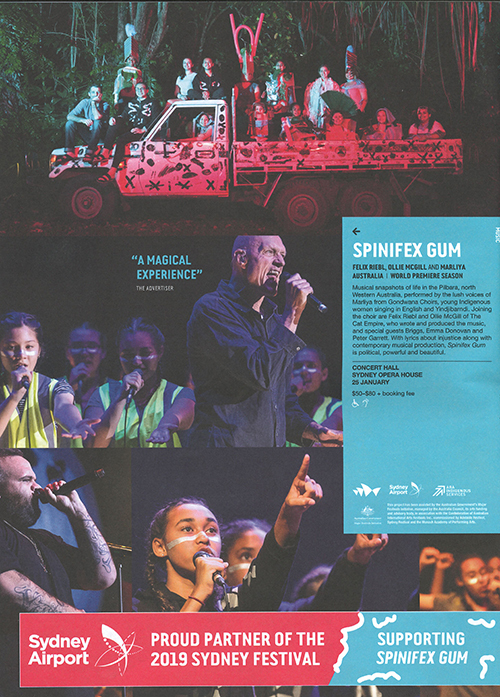 In Spinifex Gum, Marliya – a Gondwana choir of Indigenous young women from Cairns performs songs by Felix Riebl and Ollie McGill of The Cat Empire alongside Briggs and Peter Garrett. As well as Marliya, the Sydney Festival’s indigenous content includes, Man With The Iron Neck, a powerful new work from Ursula Yovich and Legs on the Wall about a family grappling with life after suicide, Biladurang, an intimate solo work by Joel Bray, performed to an audience in a hotel room and the biennial Yellamundie National First Peoples Playwriting Festival. The Sydney Festival attracts the highest quality art from across the world, and each year transforms Sydney into a colourful celebration of summer from 9–27 January. This year’s event features 18 world premieres, city-wide free events and art in some very unusual places. Cairns Indigenous Children's Choir New Singers Welcome!